Can you feel that? Yeah it's that time of year... again. The seasonal transition is in full swing and whether we realize it or not, it's already making an impact. According to Ayurveda we are a microcosm of the macrocosm that is the natural world. Everything that goes on outside of us, goes on inside of us as well. Which basically means that we transition - physically, mentally and emotionally - from season to season too! So maybe you have noticed it. ; cold, flu or allergies, maybe a little digestive upset or feeling foggy, heavy, spaced out or emotional. These are all mind-body signals that it's time to make some changes on the inside to keep up with what's going on outside. Staying in harmony with the seasons can actually be as simple as making a shift in your thinking and the way you move your body. And if you're looking for an easy way to maintain balance throughout the year, look no further than your yoga. Changing up your yoga practice in line with the change of seasons is a great way to adapt (acclimate) your body, mind and emotions to the influences of changing weather, activities and daylight and evening cycles. It's a simple season-shifting “hack” that can powerfully impact your experience of life and your ability to let go of the old and fully embrace the changes going on inside and out. Springtime is kapha time of year. It's cool, wet and heavy. You might be feeling more sluggish and congested during this time of year and perhaps a little less motivated emerging from the cold, heaviness of winter. Yoga for this time of year should focus on stimulating and energizing, building heat and boosting circulation. 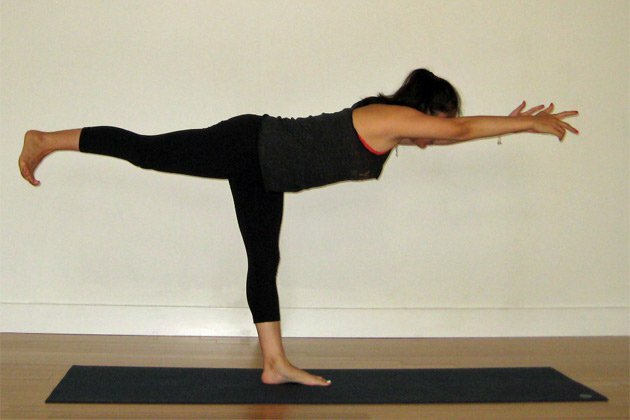 Here's five poses that'll help you do just that! One of my personal faves, this series of poses relax the nervous system while energizing and toning the entire body. Kick them up a notch by synchronizing the breath with the movement and focusing on creating internal heat and a sensation of lightness in the mind and body. Try ten rounds as a short morning practice or include three to five rounds at the start of any longer yoga practice. Otherwise known as “Fierce Pose”, it turns up the heat in the large muscle groups and will strengthen your body and your resolve (I like to call it the “Seat of Power”), especially if you throw a little “Victorious“ ujaiyi breath into the mix! See if you can hang with it for ten or more breaths and be sure to direct your energy upward (look up) and focus on creating a sensation of buoyancy from the knees up. Hello backbends! Backbends are synonymous with energizing and stimulation, this pose works on the internal organs (digestive, endocrine and respiratory) and ups the kapha-reducing factor by massaging the belly and chest (two popular kapha hang outs). Try a couple or three rounds and keep the breath moving! What better pose for feeling “floaty” than one that practically dares you to fly away! The real secret to this pose is that it not only looks pretty, it also builds core strength (a lot of it) and heat (a lot of that too!). Has energy written all over it. If you've ever practiced this pose you know that it can feel like a standing dance party. Lots of muscles come into play to make this pose work, and the secret to sticking it?... Let go of what holds you back and don't forget to breathe! Autumn is vata time of year. The drying wind brings the promise of cooler temperatures and might leave you feeling anxious, dehydrated, disorganized and disconnected. Yoga for this time of year should be warming and grounding. It should focus on building strength, heat and connection in a way that isn't too stimulating or dynamic. Try these five poses! Love this pose for bringing me back down to earth. This one releases the back and opens the hips (both areas where vata energy likes to hang out). Bending the knees slightly, rooting through the feet and focusing on creating a sensation of heaviness and stillness is great way to boost the vata-reducing qualities of this pose. There are so many ways to do this pose. The best way for vata time of year is to focus on the energy in your feet and legs. Ground the pose by intensifying your connection with the earth. Take a half or full bind if that's available to you and turn your focus inward to create a sensation of warming stillness. It's impossible to feel flighty in this pose (if you do, put something under your hips to stabilize them and take the pressure off the knees). If the sensation in the hips isn't enough to bring your focus to your body, then the deep, penetrating stretch to the knees and front of the legs will do the trick. Either way it'll warm you up and settle you down the way a good vata season pose should. To me this pose feels like home. It's a great pose for vata time. It's all about strengthening, opening and creating a refuge from the agitation (of life or even the rest of the yoga practice). Add to it a full, balanced, warming breath and you've got yoga's version of comfort food. Child's pose is also a suitable alternative. Ready to feel strong, centered and connected? This is your pose. For my money it's one of the few poses that never feels awkward or unsure (pretty much no matter how you do it). Kicking up the stability factor in this pose is just a matter of grounding through the feet and creating a sense of balanced heaviness from the hips down. Add that warming breath and you're sorted! Okay so it's time to come clean! How does your yoga practice change with the seasons? What's your favorite pose to practice year round? Wanna know how to make it kapha, vata or pitta friendly? Ask me... I'll tell ya!